On the heels of the release of iOS 6, Apple has also publicly issued OS X Mountain Lion 10.8.2, a major update featuring system-wide Facebook integration for the Mac. 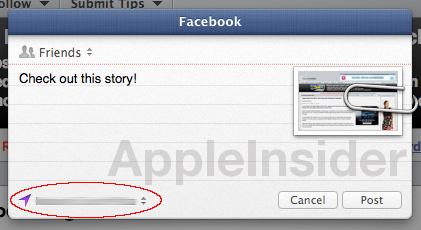 With OS X 10.8.2, users can sign on in one place for Facebook, and Facebook will appear as an option when sharing links and photos. In addition, Facebook friends' contact information and profile pictures will appear in Contacts, and notifications from the social networking site will appear in Notification Center. OS X 10.8.2 is available as a free update for Mountain Lion owners through the Mac App Store. A restart is required once the software has been installed. Dictation now supports Mandarin, Cantonese, Spanish, Korean, Canadian, English, Canadian French, and Italian.